The Olympus 7-14mm f/2.8 PRO adds the ultra-wide angle range to the PRO line of f/2.8 zoom lenses recently introduced by Olympus for the Micro 4/3 system. The 7-14mm f/2.8 is a faster and supposedly superior optic to Panasonic’s excellent 7-14mm f/4 lens that has been a staple of the Micro 4/3 system for many years. The extra speed and quality comes at a price, however, with a $1299 cost of entry for this versatile wide-zoom. Is it worth the extra dough? When compared to other micro 4/3 lenses, the 7-14mm f/2.8 PRO is a hefty beast. It’s significantly larger than any other ultra-wide for the system, and has a substantial and bulbous front element. However, you’ll find it’s similar in size to many other ultra-wide lenses for other mirrorless systems, such as the Fuji 10-24mm f/4 and the Sony FE 16-35mm f/4. The lens is made for the serious shooter, and is really intended for use on the cameras with more substantial grips, such as the Panasonic GH4, Olympus OM-D E-M1 and so on. The 7-14mm f/2.8 is a large lens for Micro 4/3, but isn’t overly large compared to many wide-angle zooms. I tested the camera using my Olympus OM-D E-M5 with the horizontal grip, which made the lens easy to handle in the field. The width of the main barrel of the lens does make clearance a bit tight with this grip, but it’s not bad at all. I wouldn’t recommend the lens for use with the smaller bodies such as any of the Olympus PEN series or the Panasonic GM series. The lens is constructed predominantly of metal, and the overall build quality is very good. The large permanent lens hood is made of plastic, and feels a bit cheaper than the rest of the lens, but the overall impression is one of quality. The zoom and focus rings move smoothly, with nice damping, though the zoom ring sort of ‘snaps’ into the 7mm setting. It’s a minor thing to note, but it did take away slightly from the otherwise excellent haptics. The 7-14mm features a focus clutch mechanism like the other PRO series zooms, providing instant access to manual focus by pulling back the ring. This also reveals a focus scale and has hard stops for the ends of the focus range. Manually focusing is easy, and the focus ring provides adequate resistance for a nice focus feel. 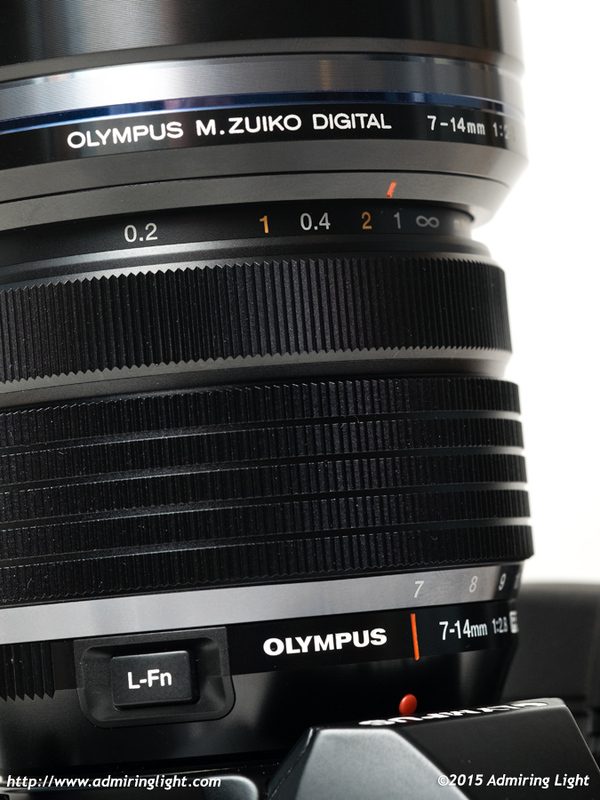 The 7-14mm, like many Olympus lenses, features a programmable L-Fn button that can come in handy for quick access to settings on the camera. The lens is sealed against dust and moisture, and while I didn’t have an opportunity to thoroughly test the weather sealing, I have confidence in it given the strong showings Olympus has shown in this area with all of its sealed Micro 4/3 lenses. There’s not too much to talk about with regards to autofocus, given the very wide field of view. The focus throw of such a lens is always going to be short, so it’s no surprise that the Olympus 7-14mm PRO is a very fast focusing lens. In essentially any lighting situation, I found the 7-14mm very quick and very accurate with regards to autofocus. Certainly nothing to worry about here. 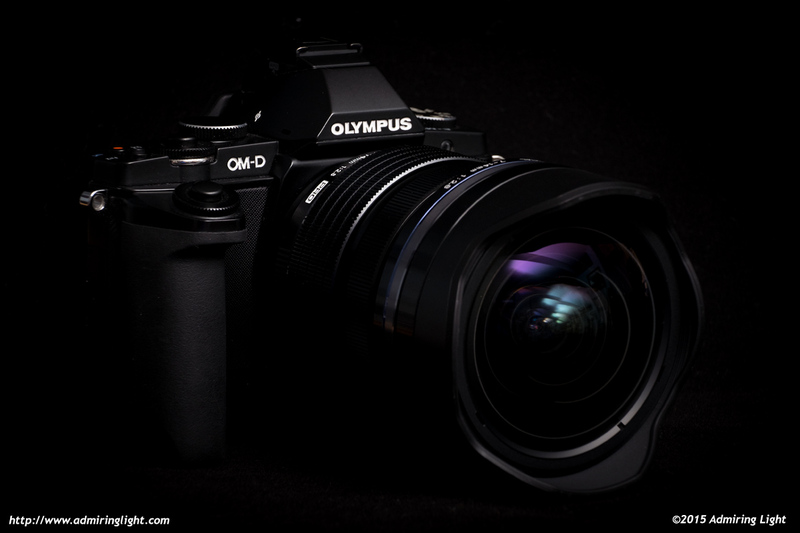 The 7-14mm f/2.8 PRO does not have an optical stabilizer, as all Olympus Micro 4/3 bodies have in-body stabilization. For Panasonic shooters, it’s still not anything that is really too much to worry about, especially given the performance at f/2.8. While stabilization is always nice, it’s not essential on a fast ultra-wide angle lens. 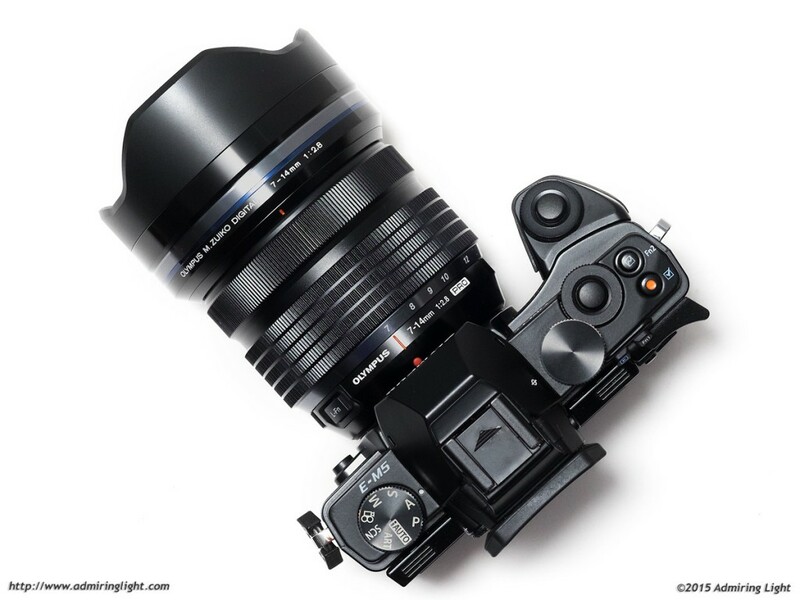 As I’m shooting Olympus and Fuji X bodies – like you – I would like to know what you would favor personally, the Fuji 10-24 or the Olympus 7-14. How are both of these in comparison to the Olympus 9-18mm in the overlapping range? The 7-14 is the sharpest of the three. I think that none are perfect, but all are quite good. If you’re debating between this lens and the 9-18, it really comes down to whether you value resolution vs. compact size. The 9-18 has good resolution, but it’s not the same as the 7-14. Vs. the Fuji 10-24, things are a bit closer. The Fuji can flare in the right circumstances too, but it isn’t nearly as obvious, and it also controls CA better. That said, the 7-14 is still a bit sharper throughout the range. I own both Olympus 7-14 and 9-18 lenses and for my needs, I wouldn’t want to be without either lens. For any long trek, especially for street shooting, I much prefer the 9-18 for its lightness, compactness, and screw-in filter capability. It’s my favorite WA lens. Rarely do I need 7mm wide angle, but I often use the longer focal lengths of the 9-18 lens, which is plenty sharp and software correction takes care of distortion and CA. The 7-14 is essential for architecture & interiors and yes it delivers superior IQ. Thanks for a great review. I love your reviews, very informative and wonderful photos. I would also like to know, if you compare the fuji10-24 to the oly 7-14, which you prefer. Thank you! I’d like a bit more in depth comment on how it compares to the Panasonic 7–14 f/4. I no longer have the Panasonic 7-14, so I couldn’t do a direct comparison, but I shot with it extensively for a few years. My impression given that time gap is that the Olympus is a bit sharper, especially at the corners, though regular lens flare is better than the Panasonic. For interior shooting, however, the Olympus doesn’t have the ‘purple reflection’ problem that the Panasonic displayed when shot on Olympus bodies. How about a comparison with the 9-18mm? It’d be interesting to see how much difference there actually is and what we are sacrificing for the smaller size. Regarding the purple blobs with the Panasonic 7-14 on Olympus bodies, for anyone who is concerned about it – it is caused by a weak UV filter on the Olympus sensor stack. It can easily be eliminated with a simple Haze 2A UV filter. Unfortunately, this does require adding the rear filter holder from the Panasonic 8mm fisheye and using a Wratten 2A filter gel. Not a hard modification, but irritating for those with Olympus bodies nevertheless. Great review and I concur 100% with your assessment of this terrific lens. I got mine shortly after it was released. Have been enjoying looking at the world “wide-eyed.” Have some spectacular flower close-ups throughout the 7-14mm range. This new “PRO” lens has no filter threads. It it’s aimed for landscape photographers. How smart is that? Well, neither does the Nikon 14-24, the Canon 11-24, the Tamron 15-30, or the Sigma 12-24. If you want a field of view wider than ~107 degrees or so, the front element is just too bulbous to allow filter threads. You can also get adapters for Lee / Cokin-type square filters that clamp over the hood. Not necessarily. Plenty of such lenses have filter threads : Tokina 11-16, Sony 10-18, Sigma 10-20, Canon 10-22, Nikon 10-24 etc. None of the lenses you mention are as wide as this lens. Those lenses are all APS-C lenses, with the widest of them having a field of view equivalent to ~15mm on full frame, as opposed to 14mm here. It may not sound like much, but I’ve yet to see one 14mm equivalent lens with filter threads. I own the 12-40 an 40-150 Pros and consider them excellent. But I’m not at all convinced with this 7-14. Seems like it has too many glaring flaws to be worth the money. Flare issues, and no way to use filters, for example. Seems like this design was not as well thought out as previous Pro series lenses. Did I miss them or are there no example photos of the lenses “horrible” flare characteristics? my bad…I see the one image…hmmmmm….the flare does seem a bit extreme for a lens in this price range for this format…. There’s the one with the fire escape on this page, and if you enlarge the image below where I discuss the flare on page 2, you can see a tremendous number of ghosting artifacts. Not only the purple blob to the left of the image, but a big series of white flare ghosts mid/right frame, plus the purple bleed. Thing is, if the sun is included in the frame, that level of flare is there no matter where. The shot with the fire escape shows what it does with the sun at the corners/just out of frame. Once I saw this, I often chose to exclude compositions that had the sun in them. I have successfully used the Pany 7-14mm f/4 for years (especially for architecture shots), but I have traded it for the new Olympus 7-14mm Pro f/2.8. It is common knowledge that very wide angle lenses are very prone to flare and CA at the edges of the frame, and this was the case for the Pany 7-14mm on my Olympus M5 and M1 bodies. I have read every test report I could find on the Olympus Pro 7-14mm, and it’s CA and overall sharpness ratings have been superior to those of the older, slower Pany 7-14mm lens. Further, large purple blobs very not infrequent in interior shots with the Pany when bright window light was present. Getting the new Olympus Pro 7-14mm is an upgrade for me over the Pany version even thought the latter gave me great service for years. Olympus (or Panasonic) should make an UWA prime (actually, given the amount of people who seem to adapt, it only makes sense to address very well the wide end). Every wide angle zoom I know of will have problems with flares and sunbursts, not to mention expensive filters. Resolution in the corners is great, but it means nothing when there are colorful blotches all over the image. This Olympus is actually surprisingly bad (in this particular aspect) for its price. I used it for 8 years (from 2006 until today), the Zuiko 7-14 F4, the Old lens suffers from what I can see, the same problems of ghosting and flare of the new lens, I could know if the quality is the same? Are you able to comment on how this lens compares to the Four Thirds 7-14mm F/4.0 lens? Obviously it is smaller and one stop faster, but apart from those factors? I ask because I have the Four Thirds lens which I use on an E-M1 and so focusing is OK. I’m been wondering whether to sell the F/4.0 lens and buy this Pro lens. I am not. I have never had the pleasure of using the FT version of the 7-14. To be honest, I’ve never actually used a FT camera or lens. I dove in with Olympus with the original E-P1. I’m looking for something wide for my GH4 that is decent in low light. would you pick the Olympus 7-14 over the Tokina 11-16 w/ speedbooster? Pingback: ????????? M.ZUIKO DIGITAL ED 7-14mm F2.8 PRO??????? | ???????????? ?